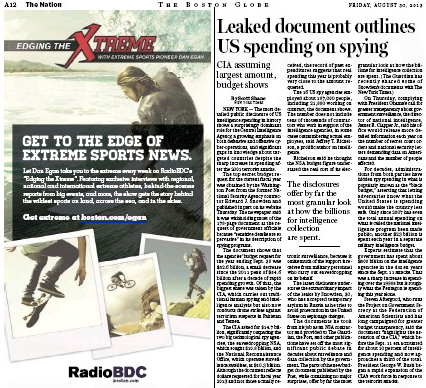 Edging The Xtreme with Dan Egan focuses on the hip and happenings of the extreme sports world, with exclusive interviews with regional, national and international athletes in the world of skiing, snowboarding, mountain biking, surfing and so much more. Be interesting to see how much more talk RadioBDC will start offering, yes? This is what the Boston Herald lives for. 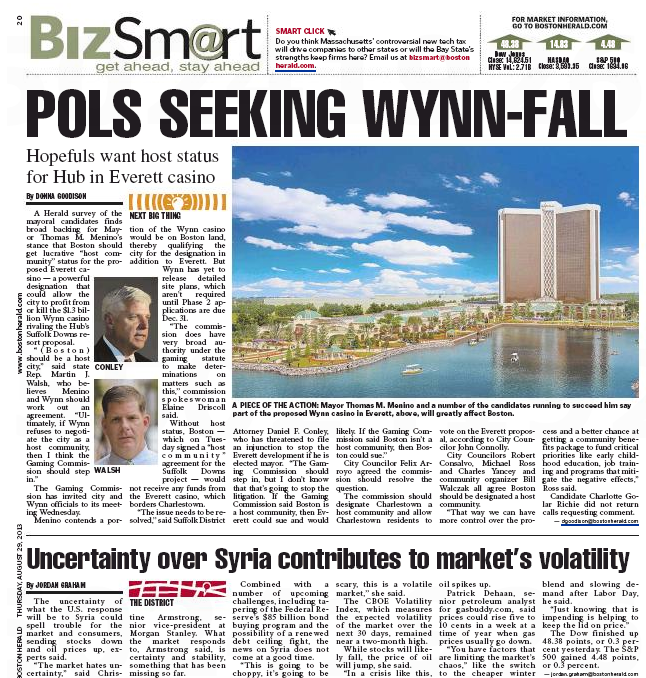 Our feisty local tabloid devotes nearly four full pages to the casino-industrial complex today. Corruption! Rampant patronage! Zero accountability! For the Herald, this deal is the grift that keeps on giving. 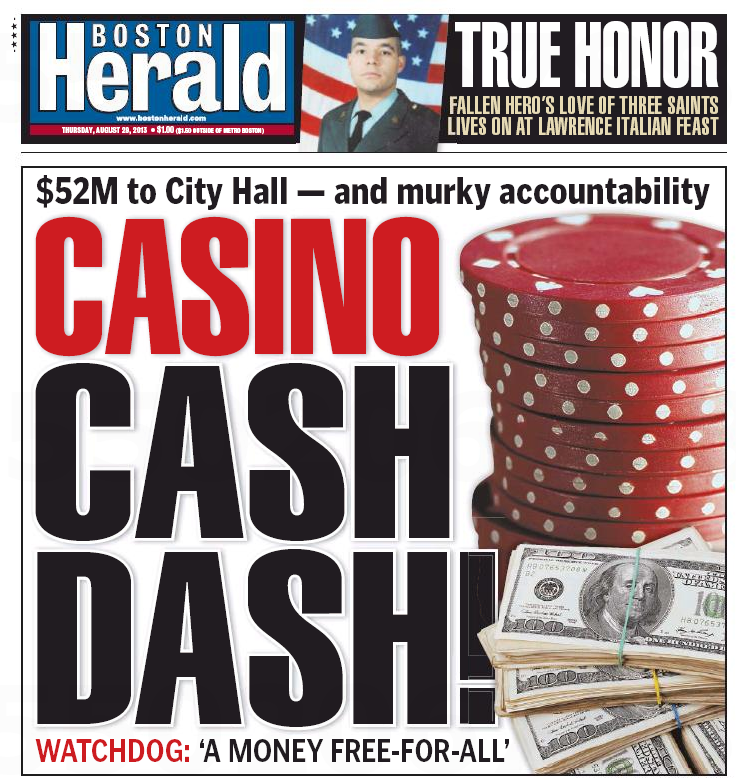 Aside from some mild finger-wagging by columnist Adrian Walker over Boston Mayor Tom Menino’s ram-rodding this deal through, our stately local broadsheet has had nary a discouraging word about the proposed billion-dollar gambling hell – sorry, hall. C’mon, Globeniks – get on this stick. Where’s that righteous indignation about gambling? Or even some of your trademark tsk-tsking? You gonna let the Herald have all the fun? 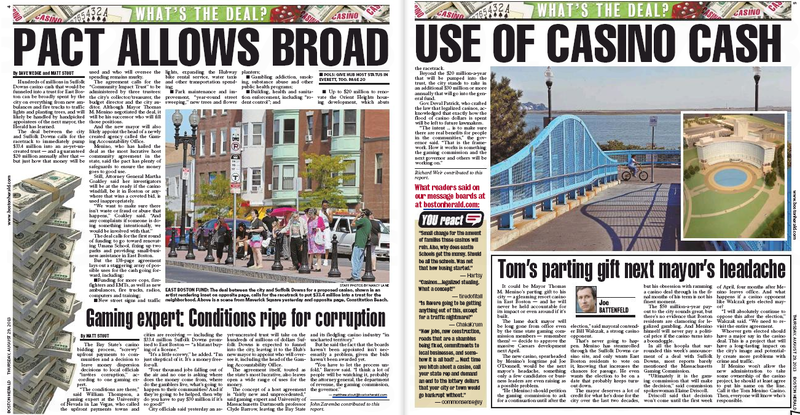 The Boston Herald and the Boston Globe do casino-half-full/casino-half-empty in today’s editions. The story itself gives a more detailed set of numbers. A Suffolk Downs casino would pay Boston at least $32 million annually — and potentially far more — while guaranteeing at least 4,000 permanent jobs and providing East Boston an upfront payment of $33.4 million, under an agreement signed Tuesday with Mayor Thomas M. Menino. The deal includes provisions that would substantially increase the annual payment to the city if the casino is highly profitable. 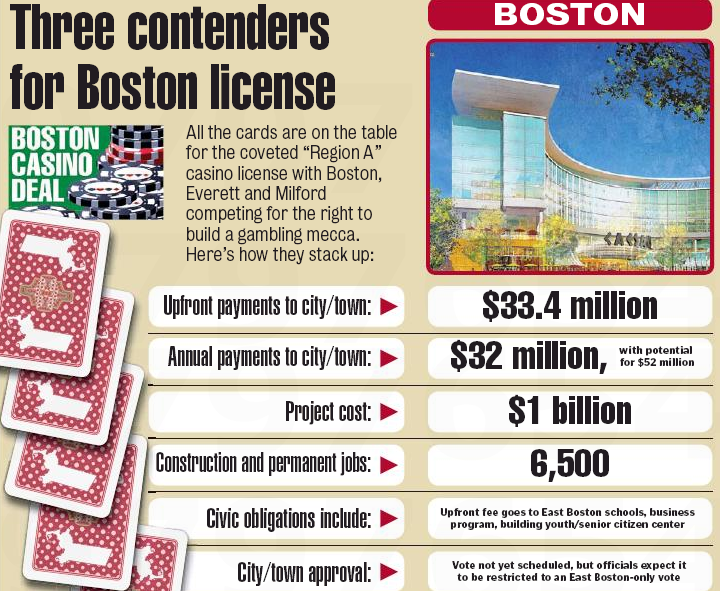 Under those provisions, the deal could be worth $52 million for Boston annually, based on projections from a city consultant that the resort would gross $1 billion per year in gambling revenue. You need to go down to this graphic to get the more modest number. Then again, overstatement is pretty much the Herald’s business these days. 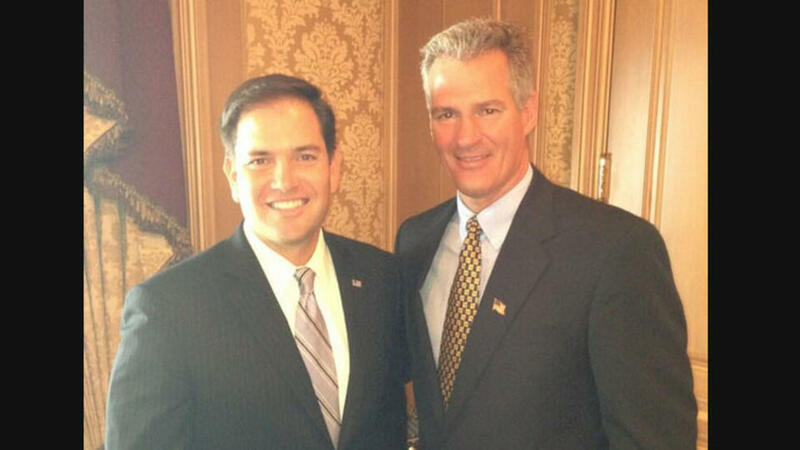 It’s clear by now that former Sen. Scott Brown (R-Elsewhere) will do pretty much anything to grab a piece of the media spotlight. It was a political twitter tornado. Maybe a GOP ticket in 2016? Yes, and maybe the hardreading staff will win the Nobel Peace Prize for Two-Daily Town. “In the form of an update, as i was rushing to get a plane I responded — maybe to a charitable appearance request. That’s what I get 4 rushing,” Brown [tweeted]. Conclusive proof the Scott Brown truly doesn’t know what he’s talking about. Of course Brown has had Twitter mishaps before, the most memorable being his midnight rambling last January. It is said that the act of texting (or, by extension, tweeting) automatically removes 10 I.Q. points. Those are points Scott Brown can ill afford to lose. 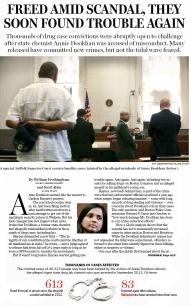 The Boston Globe, for its part, was smart enough to ignore the story altogether. 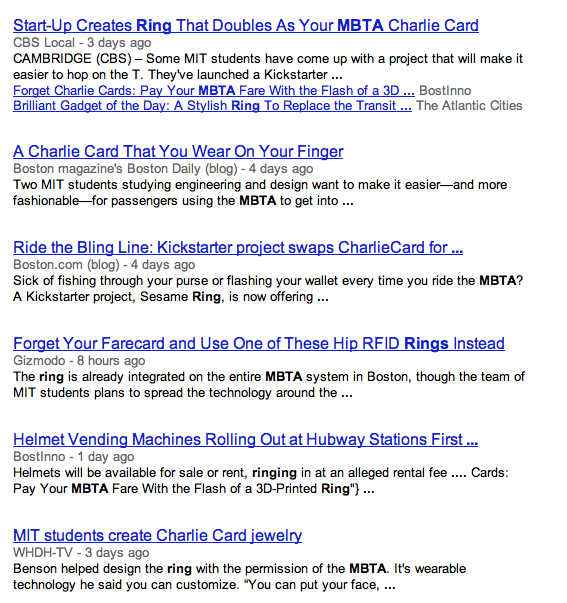 Boston Globe a Day Late, Charlie Card Short on MBTA Ring Story? 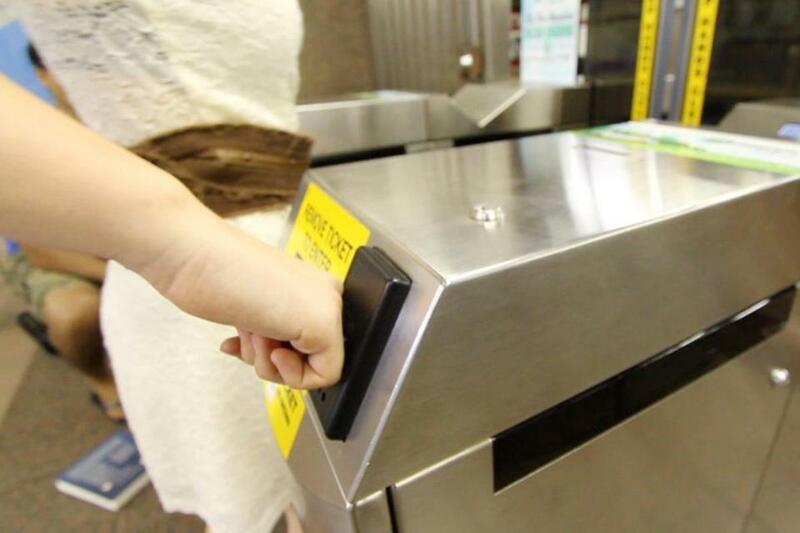 Sick of fishing through your purse or flashing your wallet every time you ride the MBTA? A Kickstarter project, Sesame Ring, is offering stylish RFID rings that you can simply tap against CharlieCard readers as you sail through the crowds. At first glance, the Globe is sucking hind teat here. But look closer and you see that Globe kissin’ cousin boston.com had the story four days ago – before the other news outlets. 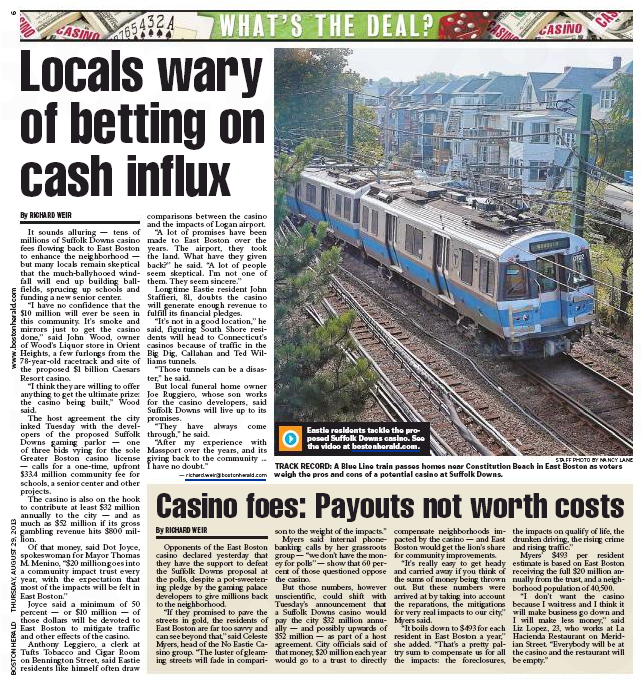 Two-Daily Town Assignment Desk: Let’s see if the Boston Herald, routinely a lively index to the Globe, picks up this story in the next few days. 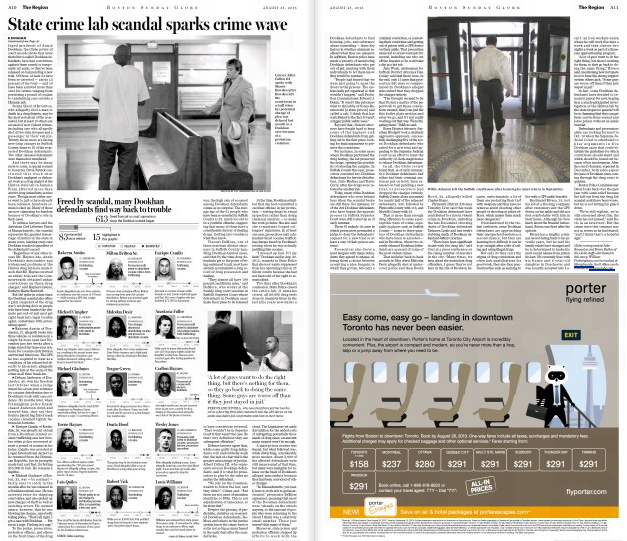 The Globe proceeded to devote another page-and-a-half to tracking Dookhan defendants freed by the crime lab debacle. Meanwhile, Sunday’s Boston Herald did what the feisty local tabloid always does: Inflate the personal into the political. That’s certainly newsworthy in its own right, but what the Herald will never admit is that the Globe story will be its assignment desk all this week. That’s the Two-Daily Town two-step in a nutshell. Vin Scully, the legendary 85-year-old broadcaster who has called Los Angeles Dodgers games for lo, these last 64 years, has just re-upped for 2014, and the Boston Globe’s Dan Shaughnessy paid tribute to him in Sunday’s edition. Ted Williams, Jimi Hendrix, Bill Russell, Leonardo Da Vinci, Jim Brown, Winston Churchill, Bobby Orr, Yo-Yo Ma, Muhammad Ali . . . The best who ever lived. 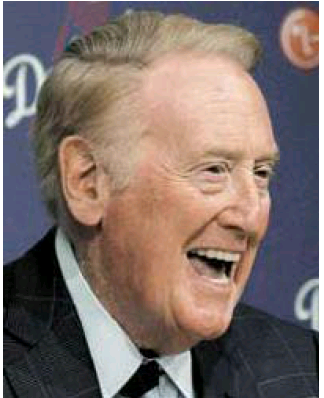 On Friday, the Dodgers announced that Scully will be back as team broadcaster for his 65th year in 2014. A humbled Scully, now 85, gracefully participated in a press conference, telling the assembled media that he wished the Dodgers had simply released the news with a single line in the evening’s game notes. 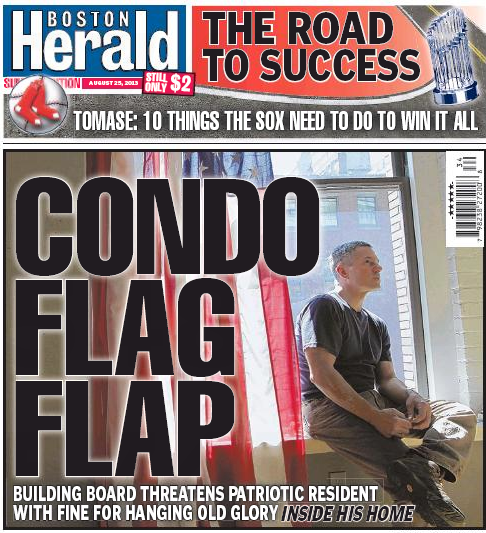 The Sunday Boston Herald had nothing. You are currently browsing the It's Good to Live in a Two-Daily Town blog archives for August, 2013.